Mariana Villa was an HNN intern. From the bullet he fired into his brain, of course. The Third Reich occupies one of the darkest chapters in the history of humanity. Accumulating popular support after Germany’s loss in World War I, by the 1930s the Nazi Party became powerful enough to grant its leader the position of chancellor and later dictatorship of Germany. This man, Adolf Hitler, is remembered today as the man responsible for the systematic extermination of 6 million of Europe’s Jews. Today, the Third Reich no longer stands. It outlived its leader by only a week. But exactly how did this "man" (for lack of a better word) spend the last moments of his existence? How did Hitler die? 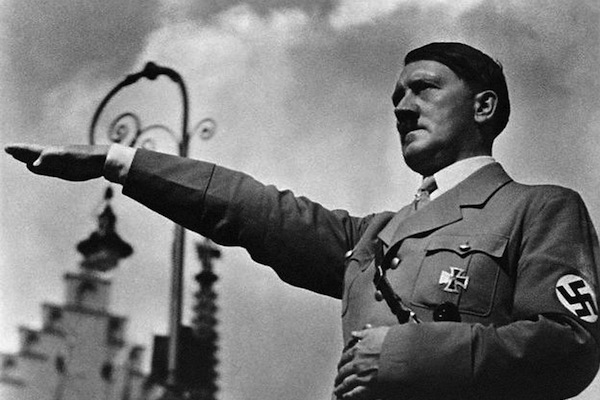 History has chronicled April 30, 1945 as the day that Hitler committed suicide. But in order to understand Hitler’s death, one must revisit the events that paved the way to Hitler’s demise. At the beginning of 1945, the war was not going in Germany's favor. In the west, British and American troops were perched on the German border, while in Poland the Soviets launched a new offensive which resulted in the liberation of Warsaw and Krakow. The Hungarian capital of Budapest fell in Feburary -- by April 13, Vienna was in Russian hands. Meanwhile, by early March Allied troops had crossed the Rhine and reached Elbe on April 11. With the Soviets breaching the defense line on the Oder five days later, the path to Berlin laid wide open. Germany’s chances must have looked progressively bleaker to Hitler from his subterranean abode. For on January 16, Hitler had moved into his führerbunker in Berlin. Located fifty-five feet below ground and reinforced by a sixteen-foot thick concrete roof, the bunker served as the last main Nazi headquarters. His head was slightly wobbling. His left arm hung slackly and his hand trembled a good deal. ... His face and the part around his eyes gave the impression of total exhaustion. All his movements were those of a senile man. FDR’s death on April 12 momentarily lifted Hitler’s spirits in the hope that America would withdraw from the war. Shortly after this proved not to be the case, Eva Braun, Hitler’s longtime companion, arrived at the führerbunker and refused to leave his side. The atmosphere in the bunker during the last weeks of Hitler’s life was saturated with resentment, distrust, and accusations. On April 22, Hitler announced at his military conference that the war was lost and berated the men under his command for their cowardice, treachery, and incompetence. He also announced his intention to end his life and thus end his struggle. The next day, Hitler had his commander-in-chief of the Luftwaffe in Germany, Herman Göring, arrested for high treason. The final blow, however, came two days before his death, when he was informed that Heinrich Himmler, someone who he believed was one of the most committed supporters of Nazism, had attempted to make peace negotiations with the Allies. On April 29, Hitler married Eva Braun. Following the brief celebration, Hitler settled the terms of his last will and testament where he shed any responsibility of having had any part in causing the war and instead claimed international Jewry was the real culprit. In it he also set up the succeeding chain of command, naming Admiral Karl Dönitz his successor. Finally on April 30, Hitler and his new wife committed suicide. She accomplished it by ingesting cyanide and Hitler by shooting himself through the mouth. The bodies were burned as Hitler had instructed. A week later on May 7, Germany surrendered to the Allies. In the sixty-seven years that have passed since Hitler’s death, various theories have sought to reassess this event. Some hold that he escaped Berlin and fled to Argentina, others to the Antarctic; still others claim that Stalin was involved in some sort of conspiracy against him. But historical facts are historical facts -- Hitler died in Berlin on April 30, 1945.